Nite Ize, maker of innovative accessories for bicycle safety, manages their affiliate program in the Commission Junction and AvantLink networks. They also have creative products for other outdoor adventures as well as everyday use. The SpokeLit is a fun way to combine safety and functionality. 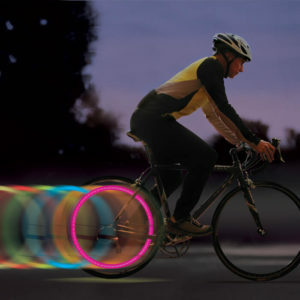 With the Nite Ize LED SpokeLit on your bicycle wheel, you’ll be clearly visible in a very cool way. It’s easy to attach and fits almost all bikes for kids and adults. Simply press the SpokeLit onto your spokes and slide into place. You can choose to have it glow or flash, and while you’re riding it will look like a moving circle of light – helping to add to visibility. You can find the Nite Ize affiliate program in Commission Junction and AvantLink. Affiliate partners receive 12% commission, in a 90 day referral period and affiliate-exclusive coupon codes. The Datafeed can be accessed in Commission Junction or AvantLink. All affiliates are encouraged to join the Nite Ize program. Affiliate program management is provided by Versa Marketing Inc.